Bruce Rogerson has been a volunteer at Point Cabrillo since 1998. 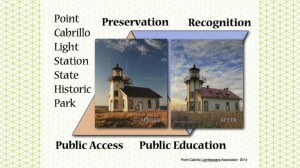 He worked on the team that restored the Fresnel lens in 1998/99, served on the board as Secretary from 2002 to 2009, researched and wrote the Arcadia Book on Point Cabrillo in 2007/2008. Bruce Rogerson was born in Kilmarnock, Scotland. Educated in Edinburgh and trained as a marine underwriter in Glasgow, he spent over 40 years as an insurance underwriter, broker and risk manager in Scotland, British Columbia and California. Bruce retired in 2004 after service with The Chronicle Publishing Company and Matson Navigation in San Francisco. He served 20 years in the U.S. Coast Guard Auxiliary as Flotilla Commander for the Mendocino and Lake County Flotillas, Division Commander for the north coast of California, as a small boat coxswain, vessel safety examiner and instructor with the Auxiliary. Bruce lives with his wife Isabel in Fort Bragg, California and they have three children and five grandchildren, all living in California.